Many cancer doctors now use a drug called Procrit sparingly. It was approved in 1989 for anemia and became a popular treatment for that side effect of chemotherapy. But regulators later learned Procrit can speed tumor growth and hasten death in cancer patients. Today, use of this class of drug—best known as EPO, a substance Lance Armstrong took illicitly to pedal faster and longer—is sharply restricted. One Florida oncology group stands out for how much it bills Medicare for the pricey drug. Medicare paid U.S. oncologists $128 million in 2012 to administer Procrit, federal data show. One-sixth of that money went to oncologists in the group, Florida Cancer Specialists. 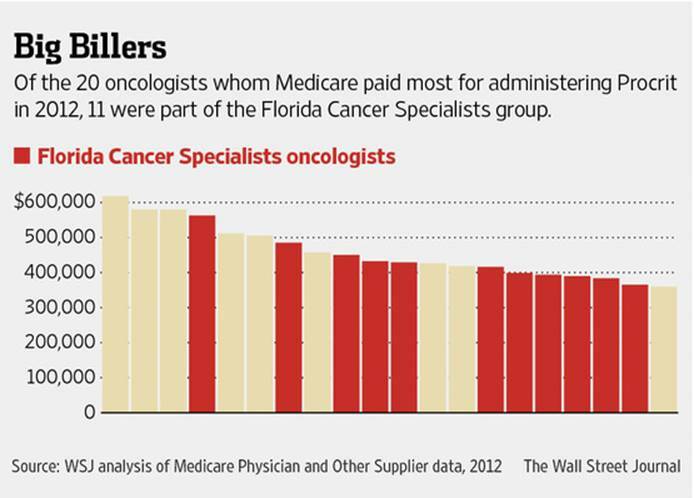 Of the 20 oncologists whom Medicare paid most for Procrit, 11 belonged to the Florida group. 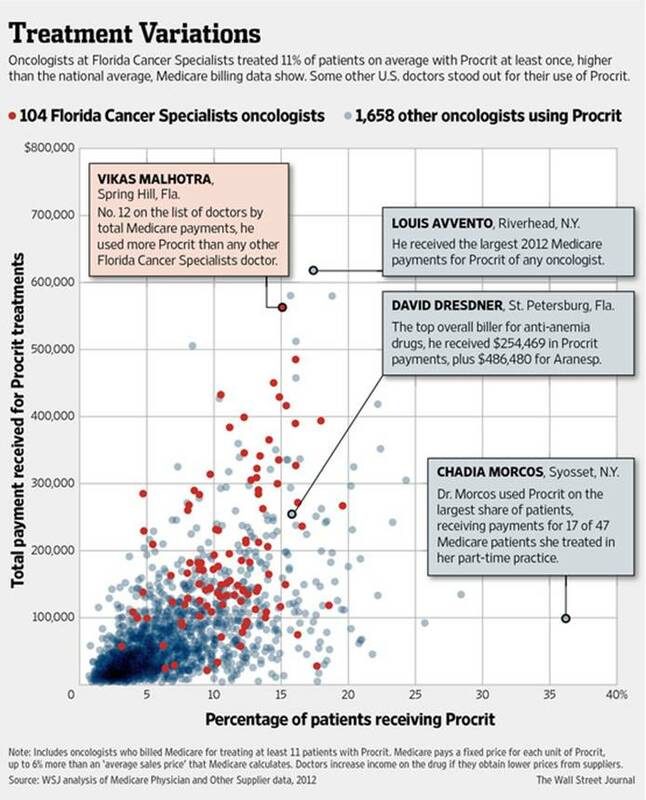 Florida Cancer Specialists, based in Fort Myers, Fla., also used Procrit at higher rates than is typical, a Wall Street Journal analysis of 2012 Medicare billing data shows. Its 104 cancer doctors in the analysis on average treated 11% of patients with Procrit at least once, versus an average of 6.2% among other oncologists who used Procrit or a similar drug called Aranesp. Some other oncologists have stopped using the drugs since 2007, when the Food and Drug Administration began warning about their risks. The FDA eventually said they shouldn’t be used on some chemotherapy patients and required doctors to warn many others of their risks. Medicare that year also announced restrictions on reimbursements for the drugs when used on some cancer patients. The Medicare data, released in Aprilafter a legal effort by the Journal to make them public, have shown how a minority of doctors account for anoutsize portion of Medicare’s costs. A look at oncologists’ billing data reveals how, despite regulators’ moves to limit the two anemia drugs‘ use in cancer patients, some oncologists still bill Medicare heavily for what can be highly profitable treatments. The wide variation shown in the Journal’s analysis “makes me think there is some excessive use,” says Otis Brawley, the American Cancer Society’s chief medical officer. “We have clear evidence that this drug stimulates tumor growth,” he says, and is appropriate for only a “very narrow slice” of cancer patients. The Medicare data may be flawed, he says, and the usage rates the Journal identified seem too high. The group’s rates are partly due to regional differences in patients’ health and in what Medicare covers, he says, adding that its electronic records system helps avoid missed treatments that might cause under-billing among other oncologists. The group’s Procrit use “has dropped significantly” since 2007, Dr. Harwin says. Its doctors primarily use Procrit for patients with kidney disease or a rare blood disorder, he says, some of whom also have cancer. Cancer doctors say it is typical for their patients, particularly the elderly, to have multiple diseases. Oncologists also sometimes treat patients who don’t have cancer for kidney disease or blood disorders that are considered precancerous. Medicare doesn’t have national payment restrictions for the drugs’ use for diseases other than cancer. The 2012 data have limitations. They include only payments to doctors for services to at least 11 patients. They include 3,026 office-based oncologists who used the drugs but not hospitals that billed through another system. Florida’s rates of cancer and kidney disease are well above the national average. Still, Florida Cancer Specialists used Procrit more than other Florida oncologists in the data, who used the two drugs on 7% of patients on average. Doctors and researchers who reviewed the Journal’s findings say differences in patients’ health aren’t likely to explain wide variations in doctors’ drug-use rates. While Medicare paid Florida Cancer Specialists the most as a group for the drugs, doctors elsewhere were the biggest individual recipients of payments in 2012. Louis Avvento, a Riverhead, N.Y., oncologist, was No. 1 in Medicare payments for Procrit, receiving $618,049 and using it on 17% of patients. He didn’t respond to inquiries. The oncologist receiving Procrit payments for the largest percentage of patients was Chadia Morcos, a part-time Syosset, N.Y., doctor who treated 36% of her 47 patients with it. She says she follows guidelines for the drugs and that her rate appears high because she treats so few. Some doctors were above-average users of both Procrit, from Johnson & Johnson, JNJ +0.97% and Aranesp, from Amgen Inc. AMGN +0.31% The top biller for both combined was David Dresdner of St. Petersburg, Fla., whom Medicare paid $740,949. He used Procrit on 16% of patients and Aranesp on 13%. He declines to comment. Ralph Boccia of Bethesda, Md., says he is among “real believers in the benefits” of the drugs for cancer patients. The oncologist, who co-wrote Amgen-sponsored research supporting Aranesp’s use in cancer patients, used Procrit on 24% of patients and Aranesp on 19%. He says his usage reflects his practice’s growth and that he follows the guidelines but considers the safety concerns overblown. Regulators first approved the drugs, called erythropoiesis-stimulating agents, for anemia from kidney disease and then for anemia from cancer therapy. Oncologists once used them widely. The drugs also gained illicit users among athletes seeking to boost red-blood-cell counts. Mr. Armstrong revealed his use of EPO, nicknamed after the generic name epoetin alfa, in a 2013 Oprah Winfrey interview. In 2007, Medicare paid doctors $1.15 billion for Procrit and Aranesp combined for applications other than dialysis, the most for any physician-administered drug. But medical-journal articles around that time linked the drugs to increased stroke risk, tumor growth and earlier death for cancer patients. In 2007, the FDA issued a warning calling attention to the findings. It ultimately changed the drugs’ labels to say that they shouldn’t be used on patients undergoing so-called curative chemotherapy for cancer—treatment where the hope is to eliminate cancerous cells—and that they hadn’t been proved to relieve many anemia symptoms. Medicare in 2007 issued a rule that it would pay for Procrit or Aranesp for a cancer patient only if blood tests showed anemia beyond a certain threshold. A small proportion of patients qualify, oncologists say. Since then, many cancer doctors have cut back on the drugs, as have many kidney doctors. In 2012, Medicare paid $363 million for the drugs, down 70% from 2007. The drugs can be lucrative. 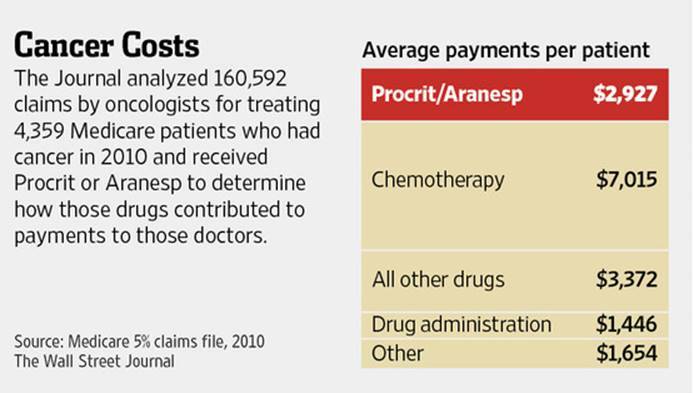 In 2012, 56% of oncologists’ Medicare payments were from drugs, compared with 5% for other doctors. Medicare pays doctors only for drugs they inject or infuse in-office. They usually buy drugs upfront, and Medicare then pays them up to 6% more than an “average sales price” based on what drug makers officially report. Pricey drugs thus yield more income than cheaper ones. Medicare paid $849 for Aranesp and $624 for Procrit for the average monthly treatment on a cancer patient, a separate Journal analysis of 2010 Medicare data shows. The 2010 data, acquired from Medicare for a fee, are the most recent the Journal could obtain showing individual patient billings. They include payments for 5% of U.S. Medicare patients. Big practices can extract discounts from suppliers that potentially yield more than the 6% margin. One oncology practice with more than 20 doctors recently could buy Procrit at low enough prices for an average margin of 21%, according to data from Oncology Analytics, a firm that helps manage insurers’ cancer costs. It declined to identify the practice. The group’s big bills go beyond Procrit. Of its doctors, 28 were among the top 100 U.S. oncologists by 2012 Medicare payments for all services, 22 of whom received over $3 million each. Payments over $3 million a year were deemed “high cumulative payments” in a 2013 report by the Medicare parent agency’s inspector general, which recommended Medicare scrutinize top-paid doctors’ billings. “We have an incredibly high expense structure,” Dr. Harwin says, largely because of drug costs. The group’s biggest payee, Vikas Malhotra, received $8.4 million—including $562,907 for Procrit—the 12th-highest 2012 Medicare payment to any doctor. He says the payment level reflects a patient-volume increase, Florida’s high cancer rates and work by nurse practitioners. The Procrit payments might trace to high blood-disease rates and referrals from kidney specialists, he says. Kidney disease is common among the elderly, many of whom meet criteria for at least minor forms of it, oncology-practice administrators say. Procrit and Aranesp billings listing kidney disease but not cancer don’t face national Medicare restrictions. And while the FDA requires doctors to have cancer patients receiving the drugs for anemia caused by chemotherapy sign a consent form that says Procrit or Aranesp “may make my tumor grow faster and I may die sooner,” there is no such requirement of kidney patients who are given the drugs for reasons other than chemotherapy. Dr. Harwin says Florida Cancer Specialists requires doctors to follow all FDA rules when giving Procrit to patients, and doesn’t use it on patients undergoing curative chemotherapy. Medicare doesn’t prohibit a doctor from billing for Procrit for kidney disease, even if the patient is in cancer treatment and doesn’t meet Medicare’s anemia threshold for billing for cancer. Some Medicare-billing experts say that if a patient has both diseases, some oncologists will list kidney disease on a Procrit bill to avoid the cancer rules. Some former employees of the Florida group who were at one office in 2012 say that if patients met the criteria for either a chemotherapy or kidney-disease claim when billing for Procrit, doctors would typically list kidney disease. Such a practice is acceptable under Medicare and FDA requirements. The 2012 Medicare data don’t provide detail for how the Florida group billed for individual patients. But the slice of patient information in the 2010 data obtained by the Journal includes individual records for 314 people the group treated with Procrit. The group’s doctors listed a cancer diagnosis for 147 of them on overall Medicare billings. When the Florida group’s doctors gave Procrit to the 147 patients, they listed kidney disease 54% of the time on Medicare bills—without mentioning cancer—and listed cancer 25% of the time. When its doctors billed for anything other than Procrit for those 147, they included a cancer diagnosis 89% of the time. One of the group’s oncologists gave chemotherapy drugs to a man in his late 70s for prostate cancer in 2010, telling Medicare the treatment had caused anemia, the data show. In a separate claim that day, the doctor billed Medicare for Procrit to treat his anemia, listing the cause as kidney disease. Sarah Cevallos, the group’s revenue vice president, says it sometimes bills separately for Procrit when treating cancer patients because Medicare’s processor in Florida sometimes rejects Procrit claims with multiple diagnoses. She says the group has passed Medicare audits without problems. A Medicare spokesman says “there are no administrative requirements that require these type of claims to be billed separately.” Medicare hasn’t identified issues at the Florida group other than small overpayments the group repaid, he says.